The Celts had no written language of their own, so most of what we know of them comes from the writings of the ancient Greeks and Romans, and later the Irish Monks, who meticulously copied down old Irish legends and stories. The ancient Celts inhabited central and western Europe. From the 2d millennium to the 1st century BC, these nomadic people, who spoke Indo-European dialects later classified as Celtic Lanuages, spread through much of Europe. From a heartland in central Europe, they settled the area of France (Gaul), moved through northern Spain, and crossed into the British Isles in around the 8th and 7th centuries BC. Moving south and southwest, they sacked Rome c.390 BC and attacked Delphi in 279 BC. One group then crossed into Anatolia and established the state of Gatatia. The modern populations of Ireland, Scotland, Wales, Cornwall, and Brittany retain strong Celtic elements. Accounts of the ancient Celts come most notably from the Roman and Greek writers, Julius Caesar (in his "Commentaries on the Gallic Wars,"), Strabo, and Diodorus, who probably based much of their Celtic ethnography on the now lost writings of Posidonius. These records are supplemented and corroborated by early Irish Literature scribed by the early Monks, including the epic tales of the Ulster Cycle. And yet these accounts are somewhat one-sided in their portrayal, as the Romans viewed the Celts as a barbaric rabble, uncouth and uncivilized. The ancient Celts didn't write their history down, at least in any media that has survived. We are dependent on Roman accounts, as well as the writings of the Monks, who added their own, Christian slant to the tales. From these sources inferences may be drawn regarding the structure of Celtic society--its social institutions, classes, and obligations, as well as Celtic customs and beliefs. Recurrent themes include the high-spirited and boastful character of the Celtic warrior, the convention of the champion's portion at the feast, the practice of single combat, and the prizing of the severed heads of defeated foes. Druids and seers feature prominently in the sources, both classical and Celtic, and many of the traditions and tales of the Celts are imbued with supernatural aspects. [The Celts told the Roman envoys that] this was indeed the first time they had heard of them, but they assumed the Romans must be a courageous people because it was to them that the [Etruscans] had turned to in their hour of need. And since the Romans had tried to help with an embassy and not with arms, they themselves would not reject the offer of peace, provided the [Etruscans] ceded part of their seperfluous agricultural land; that was what they, the Celts, wanted.... If it were not given, they would launch an attack before the Romans' eyes, so that the Romans could report back how superior the Gauls were in battle to all others....The Romans then asked whether it was right to demand land from its owners on pain of war, indeed what were the Celts going in Etruria in the first place? The latter defiantly retorted that their right lay in their arms: To the brave belong all things. The party structure would allow no resolution to be made against such noblemen as justice would have required. The Senate...therefore passed examination of the Celts' request to the popular assembly, in which power and influence naturally counted for more. So it happened that those who ought to have been punished were instead appointed for the coming year military tribunes with consular powers (the highest that could be granted). The Celts saw this as a mortal insult and a host marched south to Rome. The Celts tore through the countryside and several battalions of Roman soilders to lay seige to the Capitol of the Roman Empire. Seven months of seige led to negotiations wherby the Celts promised to leave their seige for a tribute of one thousand pounds of gold, which the historian Pliny tells was very difficult for the entire city to muster. When the gold was being weighed, the Romans claimed the Celts were cheating with faulty weights. It was then that the Celtic leader, Brennus, threw his sword into the balance and and uttered the words vae victis "woe to the defeated". Rome never withstood another more humiliating defeat and the Celts made a magnificent initial step into history. Their aspect is terrifying...They are very tall in stature, with ripling muscles under clear white skin. Their hair is blond, but not naturally so: they bleach it, to this day, artificially, washing it in lime and combing it back from their foreheaads. They look like wood-demons, their hair thick and shaggy like a horse's mane. Some of them are cleanshaven, but others - especially those of high rank, shave their cheeks but leave a moustache that covers the whole mouth and, when they eat and drink, acts like a sieve, trapping particles of food...The way they dress is astonishing: they wear brightly coloured and embroidered shirts, with trousers called bracae and cloaks fastened at the shoulder with a brooch, heavy in winter, light in summer. These cloaks are striped or checkered in design, with the seperate checks close together and in various colours. [The Celts] wear bronze helmets with figures picked out on them, even horns, which made them look even taller than they already are...while others cover themselves with breast-armour made out of chains. But most content themselves with the weapons nature gave them: they go naked into battle...Weird, discordant horns were sounded, [they shouted in chorus with their] deep and harsh voices, they beat their swords rythmically against their shields. 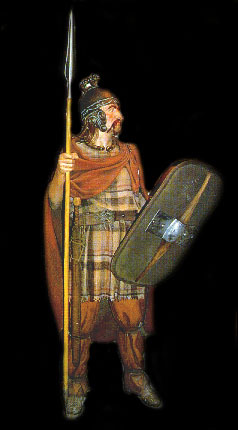 Celtic culture was largely extinguished by the onslaught of the Romans from the south and the Germanic and other groups from the north and east. Pressure from Germanic populations began in the late 2d century, as did the Roman invasions. Gaul was subjugated by Julius Caesar in the Gallic Wars (58-51 BC), and the Romans conquered Britain in the 1st century AD. Later, as Roman power declined, the Germanic tribes renewed their drive westward into the former Celtic lands. Only along the fringe of Europe did Celtic culture survive in distinct form. Email me at huathe@sacredfire.net . Copyright © 1998 The Sacred Fire. All rights reserved.